Your biggest decision, and the one to make first, is whether you want Original Medicare (Part A and Part B) or Medicare Advantage (Part C). They cover the same basic services, but they work differently. Your choice depends on what you need. You can elect to stay in Part A and B ("Original" Medicare) only. 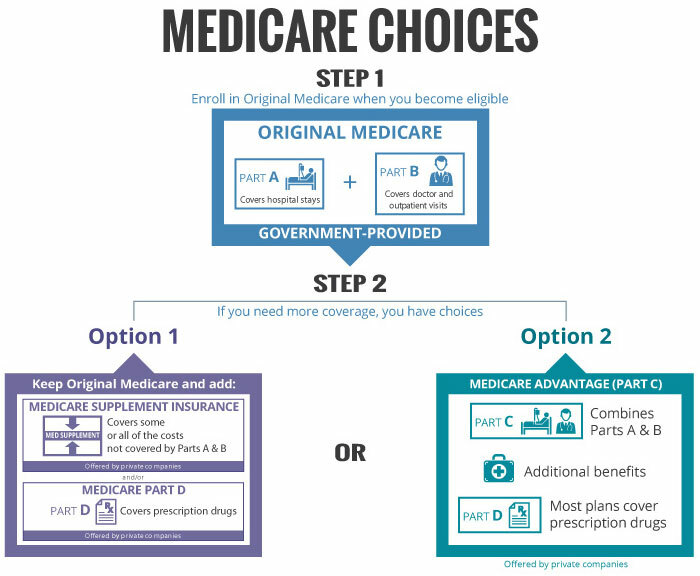 You can choose to supplement Original Medicare (Parts A and B) with a Medicare Supplement (also called "Medigap") plan. Medicare Supplements are standardized in all states except MA, MN, and WI. There are 10 basic standardized plans as well as the HiF variation. Depending on your state, zip code, and carrier, one or more of the standardized plans may be available in a Medicare SELECT version. You'll also need to decide whether you want a Medicare Part D Prescription Drug plan to cover your outpatient medications. The following chart outlines your choices. You can obtain additional information by looking at the Medicare Overview, Medicare Supplement Plans, Medicare Advantage Plans, and Part D Prescription Drug Plans pages.